Our refer a friend competition is slowly drawing to a close, but keep successfully referring your friends and you'll still have the chance to win a prize every time, including free months and years of membership! Here we have two couples who have been lucky enough to win 5-years of membership. For Bunny and Nathan, a 5-year membership came at a fantastic time. After considering to pack their bags and travel full time, Nathan's work arrangements took a new route, meaning they couldn't head off on any adventures just yet. 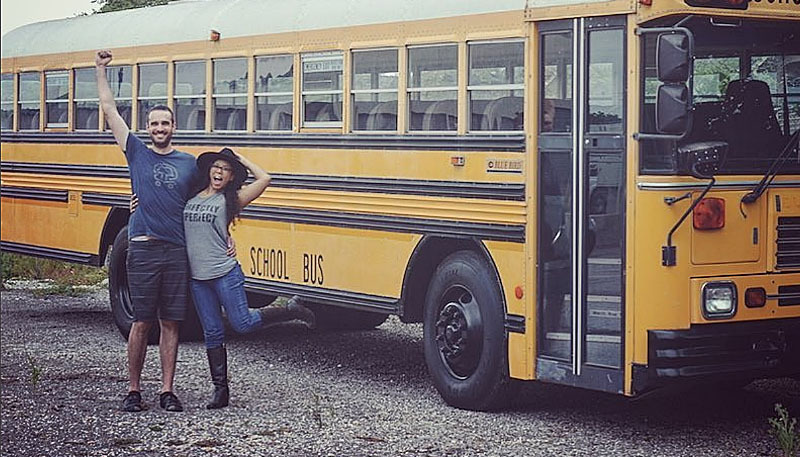 However, to take smaller steps into their new lifestyle, Bunny and Nathan bought a school bus, which they plan to renovate before their journies really kick-off. During this time they also plan to head to local sits to build up their reviews before they go global. "Our whole timeline has been pushed out by these decisions, but it's all part of the journey and we can clearly see the benefits of how things are unfolding. Having only done two sits so far, we are still newbies with much more to discover! Still, even the few experiences we've had have left lasting impressions on us and confirmed many of the reasons we felt this exchange is so valuable. From connecting with new like-minded people to the joy and challenges of being caretaker to someone else's most precious pets and possessions to getting a break from our usual routine, and much more. As local sitters just getting started, our time has been focused on establishing a quality profile, finding our caretaker groove, and earning great reviews. Once our bus conversion is complete we look forward to adding in the travel opportunities while sitting throughout the US, as well as sitting internationally and likely leaving our bus behind for someone else to enjoy while we're away. We hope to experience a variety of unique sits - from boats to B&B's, visit sustainable living initiatives across the world, and I'm particularly excited to care for small farms and farm animals." If you want to follow Bunny and Nathan's adventures, check out their Instagram. If you think they could be your perfect sitters, why not head to their profile? Tammy is our next 5-year membership winner, who was elated to of won this prize as TrustedHousesitters is such a big part of her life. After leaving the Australian military, Tammy signed up to TrustedHousesitters in order to travel the world on a minimal budget and live like a local. "I applied for about 20 housesits all over the world and decided to let the fates decide where I should go. TrustedHousesitters, started my 12-month van life adventure throughout Canada & Alaska in Winnipeg where I made the first of my TrustedHousesitters family, Margaret & Frank who travel the United States and Canada using the app and in turn have sitters for their own home. My last house sit, was on a gorgeous ranch property between Calgary and Banff, for the unforgettable Kitty & Maris. Their fur family was extra furry with 2 cats, 2 dogs and 2 horses. I stayed with Kitty & Maris even upon their return and was spoiled with their knowledge, generosity, and kindness. Ever since I have joined TrustedHousesitters, I have been spreading the word everywhere I go. TrustedHousesitters has been an incredible platform for meeting kind-hearted souls and traveling on next to no budget. I have signed up more than 20 other travelers in the past year too! It is particularly amazing for the Van Dwellers in Canada who want a warm home over the winter, whilst so many escapes to a tropical Christmas holiday. I could not believe my luck when the first time I used my code to sign up a fellow traveling couple that I won a 5-year membership! I have plans to return home for a short while and continue house-sitting in Australia before letting the fates of the App choose my next adventure!" If you want to follow Tammy's journey head over to her website here. Or, maybe you think she could be your perfect sitter - head to her profile here.